The road trips have been mighty scarce around our house since we got the lot on the North Canadian River. 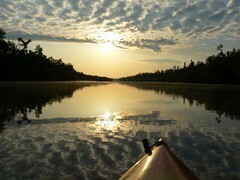 Although we have been paddling the river quite a bit, we have been doing some lake paddling as well. Our lot is near several Eufaula Lake access points and this year's plentiful rains in Oklahoma have brought the lake and river levels both to above normal. Dianne and I spent a week watching a constant parade of trees, ice chests, oil bottles and appliances floating down the flooded North Canadian River. The river current was a bit strong for our brand of paddling, so we paddled backwater river tributaries. Then, we visited the Jack Frisbee Boat Ramp and paddled the flood water and debris that accumlated in Eufaula Lake. Three hours of paddling provided us with a pretty surreal scene. Slipping through what used to be riverside trees and trails, we counted four floating freezers in the piles of drift. Clearly, freezers are the forgotten victims of Oklahoma flooding. As we paddled close to the flooded trees, insects that had been trapped by the water scurried onto our kayaks. We saw numerous juglines hopelessly tangled in oily, brush piles of driftwood, plastic bottles and styrofoam. Just about this time, I got an email from Al in OKC. He had just returned from paddling Puerto Rico and was kind enough to send me a few pictures from his trip. They have cool jungle paddling trips and night paddling adventures through waters teaming with glow-in-the-dark critters. The 2007 OKC Kayak Demo Day has been rescheduled for June 6 from 6pm to 9pm. If you have never been in a kayak before or would like to paddle several models before you make up your mind on a purchase, this evening event is what you have been waiting for. Anyone who is interested in kayaking and would like to paddle one (or more) before actually buying one, would be welcome to paddle any of our kayaks during the demo AT NO COST. There should be around 35 or more different kinds of kayaks there for people to try, from sit-on-tops, sit-in recreational kayaks, inflatable kayaks, folding kayaks and sit-in whitewater kayaks. The OKC Kayak Demo Day will give you the knowledge of what to look for in a kayak when you go to a retail store to purchase one. 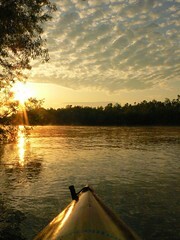 Owning your own kayak will put you on more waters, more often in more comfort than most boat renters offer. Dianne and I absolutely love our two recreational kayaks. They have opened up a whole new lifestyle for our family and a whole new love for our home state. Float the Illinois River for Free! On Friday, June 1st, you can float the river for Free, spend time with fun people and help get the river in great shape for the upcoming summer. This cleanup is a great way to be part of a community effort benefiting our local riparian environment. Last year’s cleanups collected a total of 3,500 pounds of trash from the Illinois River. To pre-register, call the Oklahoma Scenic River Commission (OSRC) by Wednesday, May 30th at (918) 456-3251 or e-mail osrc2@fullnet.net. I just got an important email from Matt Woodson the current leader of the Red Dirt Paddlers. 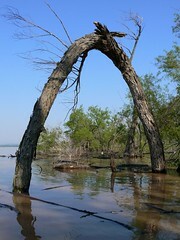 The May 9, 2007 Kayak Demo Day in OKC has been POSTPONED because there is too much rain. there are several safety concerns with floating the Oklahoma River when it is at flood stage. Keep your ears open for the rescheduled date for the Kayak Demo, and if you're going paddling, be safe. With the high water and windy conditions this weekend, Lake Eufaula was a little rough for our partucular brand of kayaking. However, the weather was warm and we needed the excercise... so we paddled a small slough just off the main channel of the North Canadian River. Locally, the area is known as the watermelon patch. Dianne caught a nice sized crappie and I got a few good pictures of beaver and birds. Over all, it is a nice little fishing hole and just a few short miles from our new river lot. This weekend we spent the night in our RV at our new river lot. After much effort, the place has been cleaned up and the water and electric are up and runnning. My reward was early morning paddling! Around 7:30am the next morning Dianne and I were able to slip our kayaks out into the morning mists and the orange light of dawn. Kayak photography is the most fun when you can get on the water early in the day or late in the afternoon and this Sunday morning was no exception. Our North Canadian River lot has cut drastically into the amount of time we have for Oklahoma road trips, but mornings like this one make it all worthwhile! Got any tips on building canoe launch sites or stone steps to scale a fairly steep river bank?